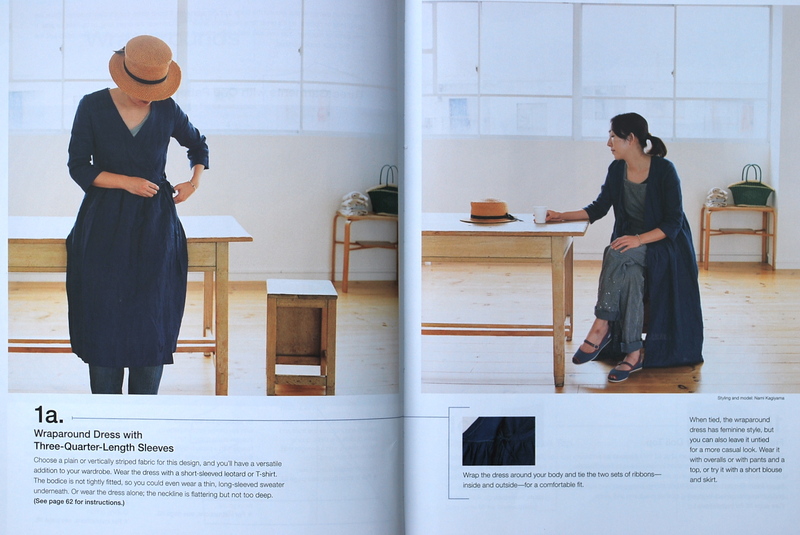 I have now become a big fan of Japanese pattern books. 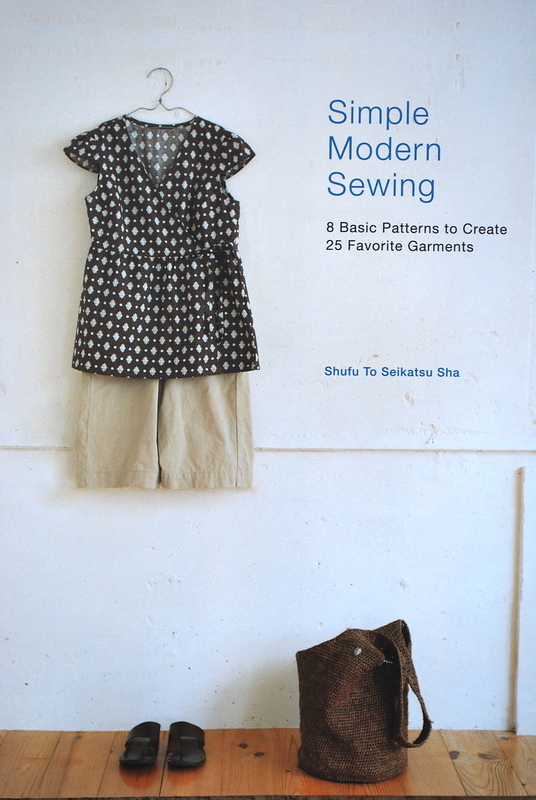 I bought my first book, Simple Modern Sewing, on sale, with a gift card, and as a skeptic. 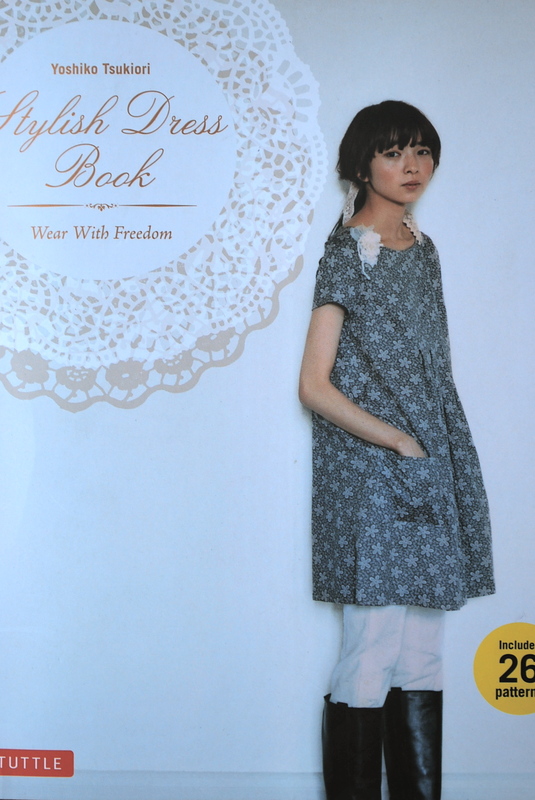 After two big wins from that book, I was compelled to buy another one, Stylish Dress Book, Wear with Freedom by Yoshiko Tsukiori. 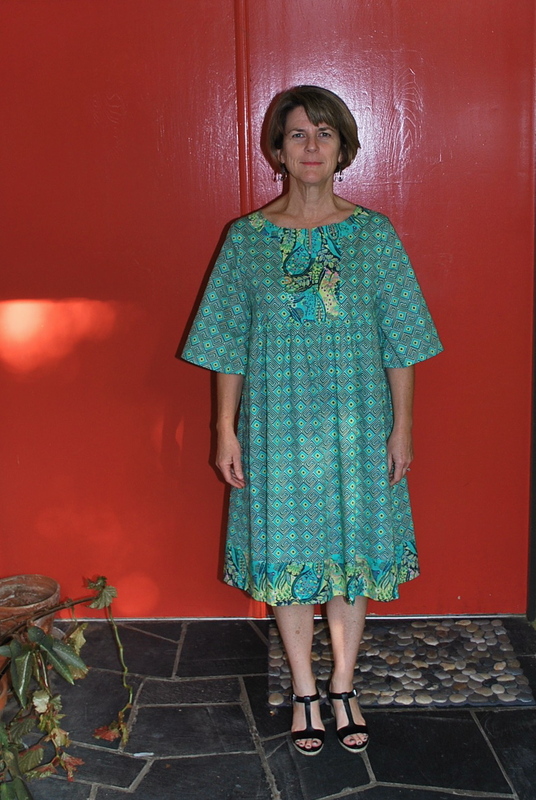 For Fresh Make #27 I chose a loose fitting, easy wear dress. 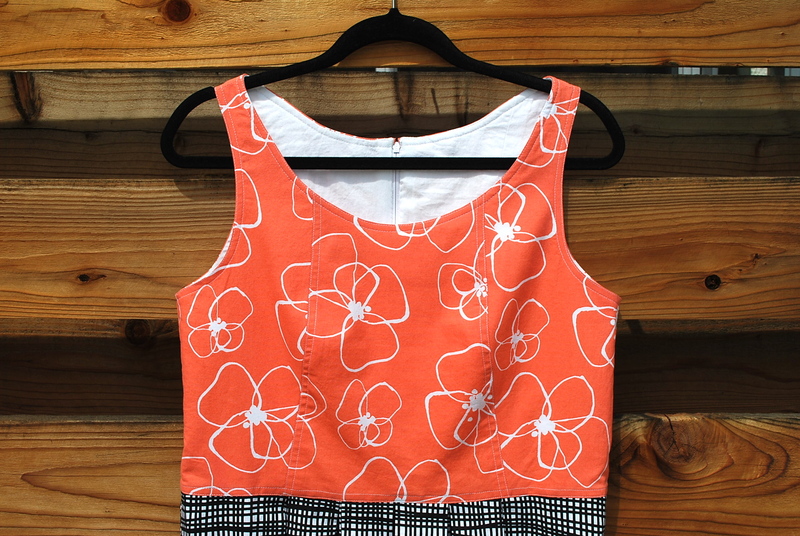 Perfect for the hot summer that’s just around the corner. 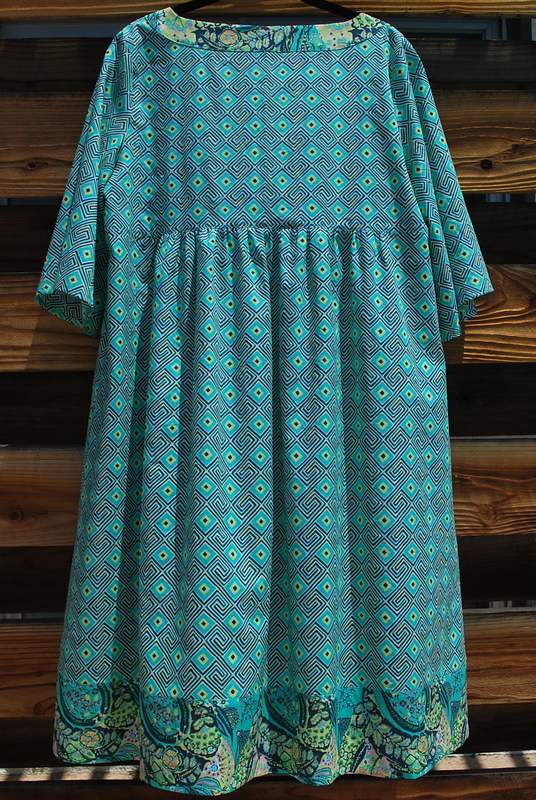 While the decision wasn’t easy from the 26 patterns, I chose Dress Y. 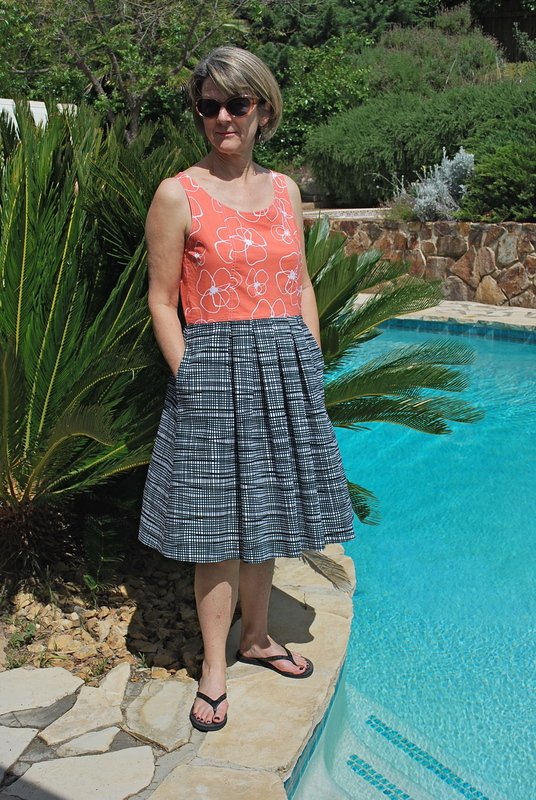 Mainly because I wanted a pattern that combined two fabrics, and also the construction didn’t look to fussy. 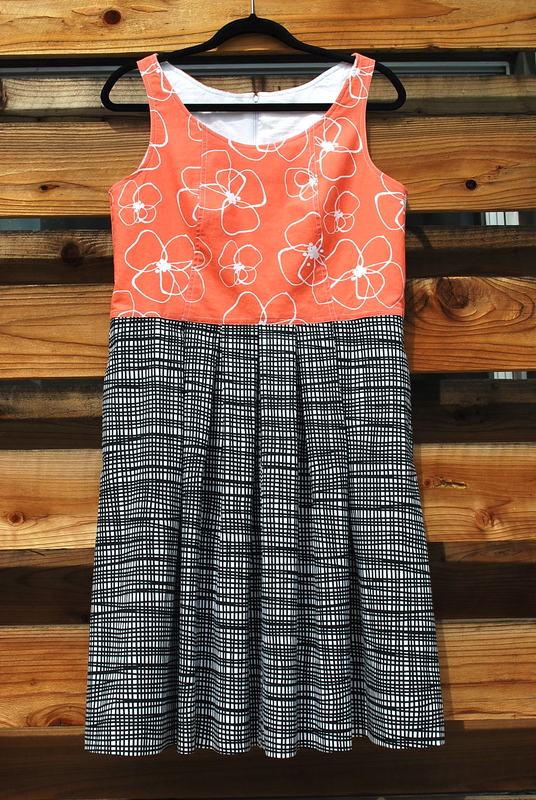 Here’s Dress Y. Those are the complete instructions! More on that later. 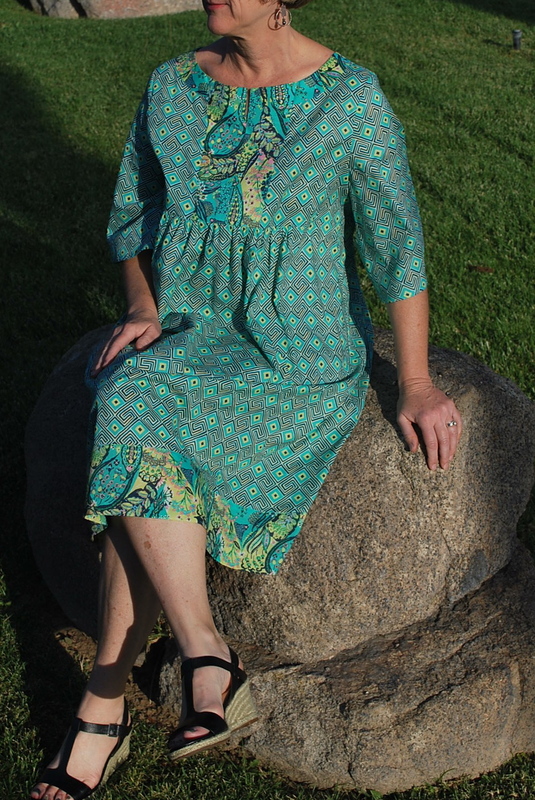 The fabrics I used are from Amy Butler’s Glow Collection, Maze Voile in Grass and Jolie Voile in Grass. 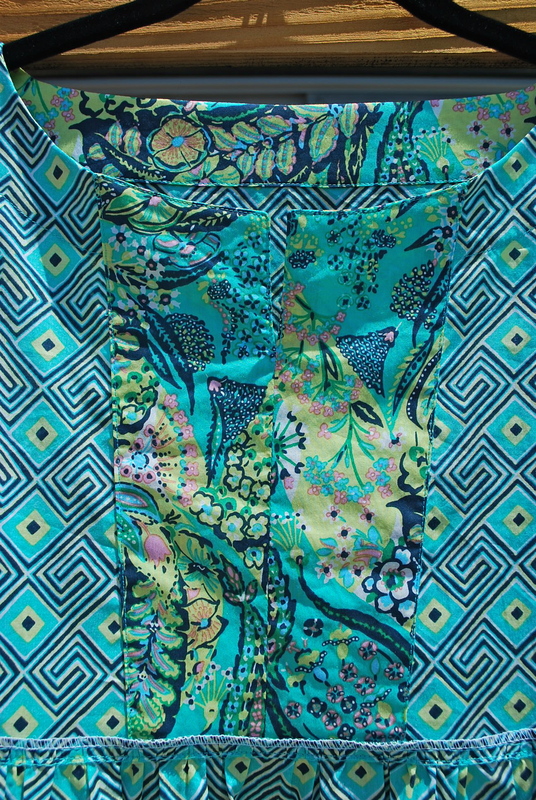 I purchased them online at Hawthorne Threads for $13.50 per yard. 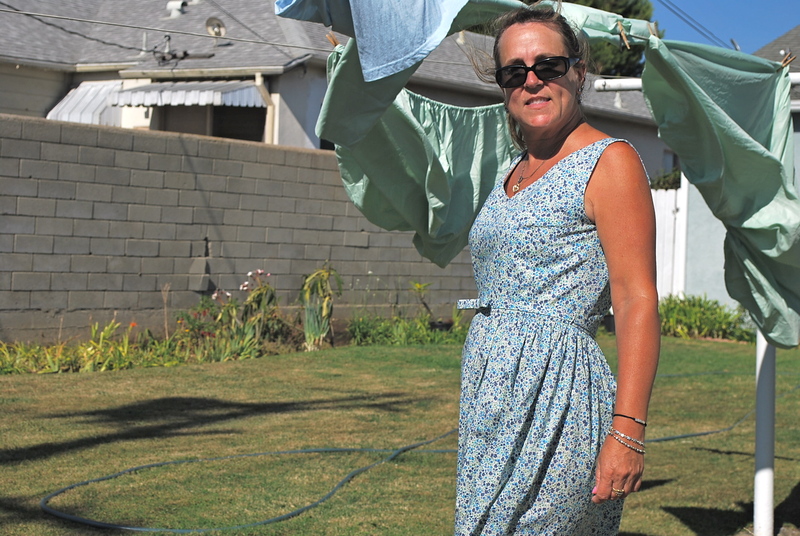 I needed a total of three yards. 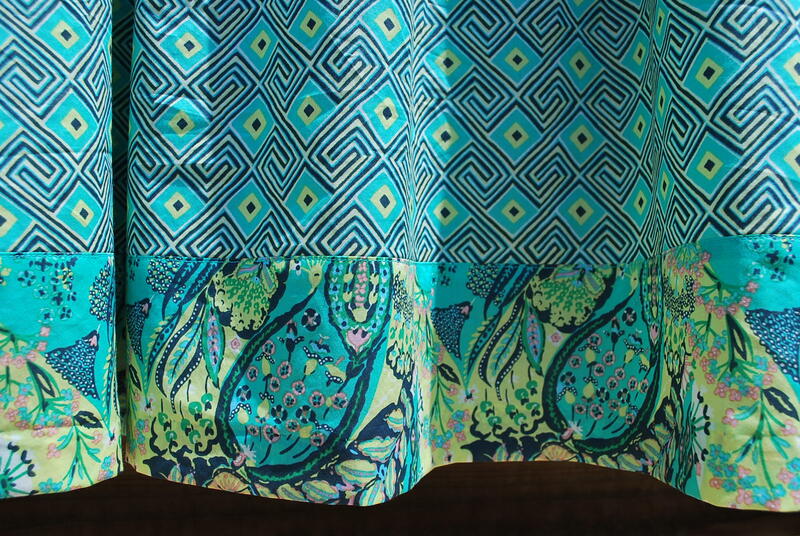 I have been coveting the cotton voiles that have recently become a part of designer collections that traditionally have only included quilting weight fabrics. 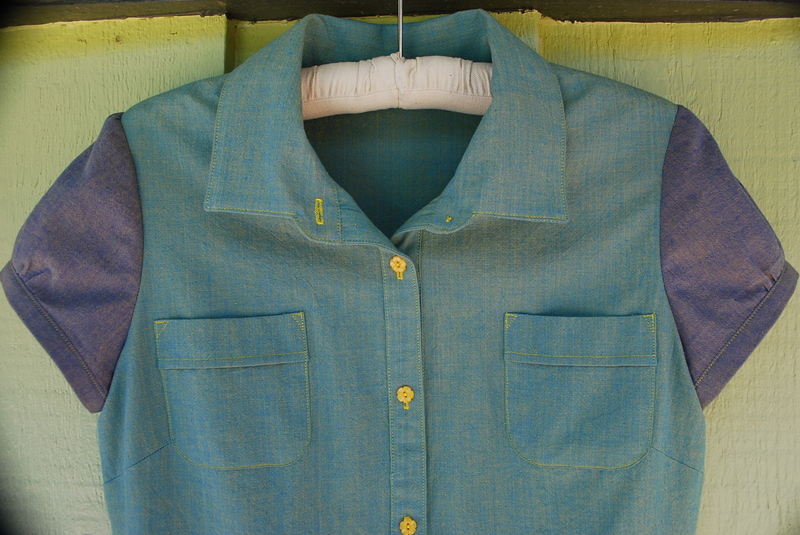 There’s no turning back once you start making blouses and dress with voiles and lawn cottons – so light weight and luxurious. 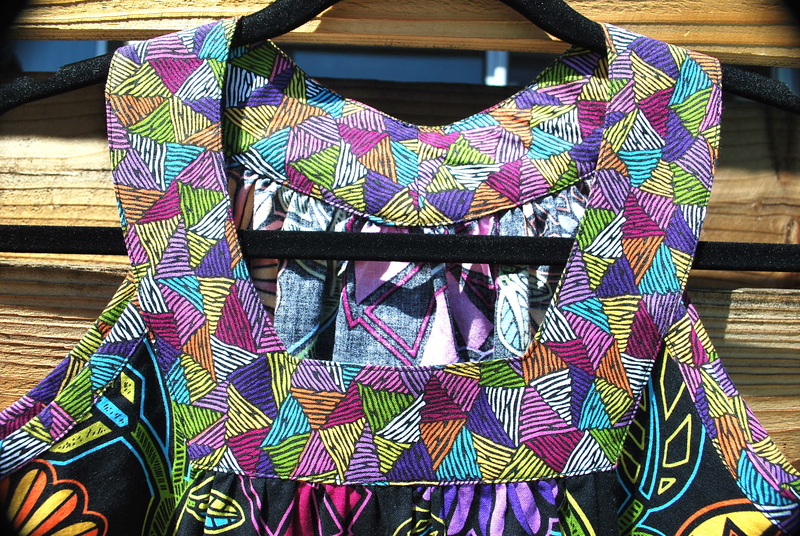 The neck trim is attached by sewing right and wrong side together at the neck edge so the seam allowances are enclosed inside when you fold the trim over to the front, and there is no need for a facing. Here’s the inside. 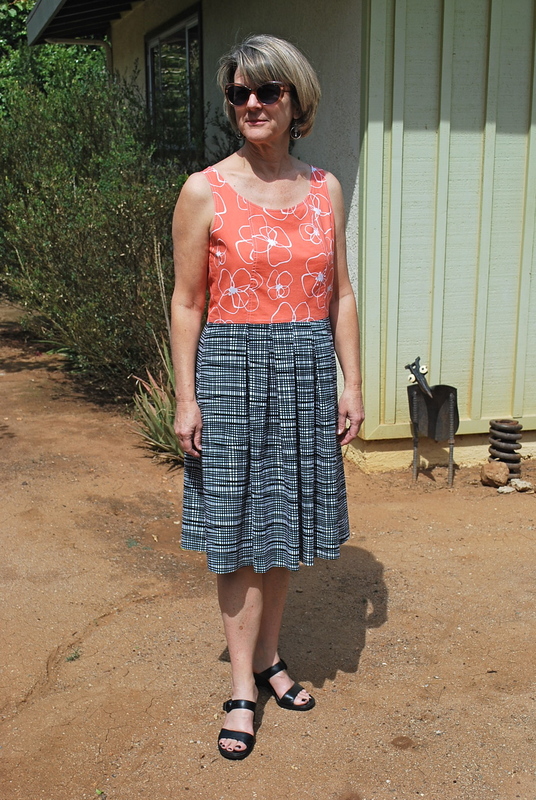 The pattern called for a single layer yoke with a bias tape trim at the top. I made a double layer for a facing instead. 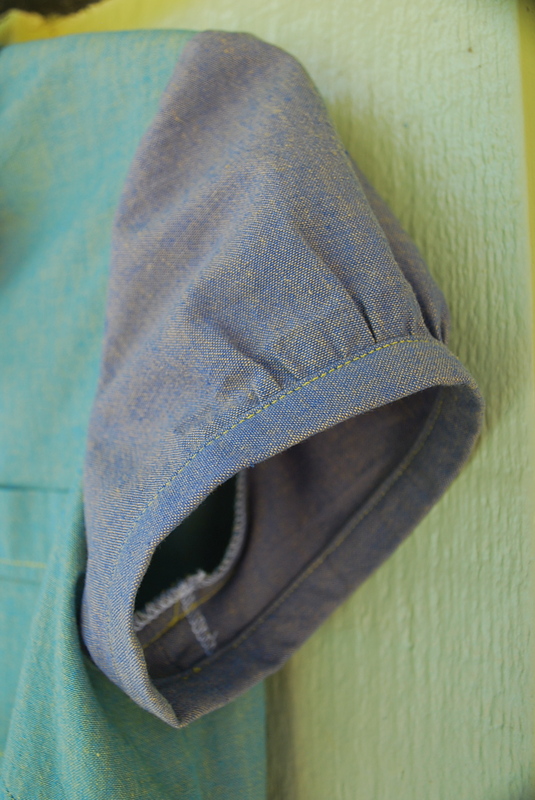 The hem band is a single layer. 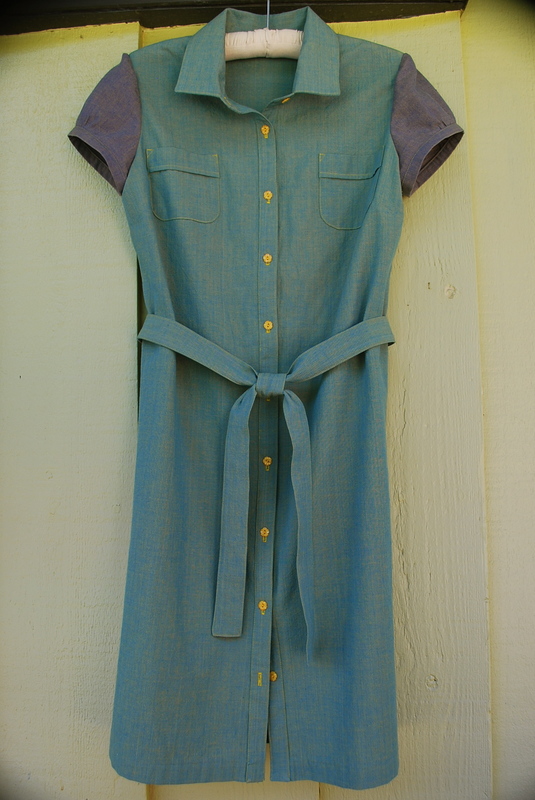 I did a 1 1/4″ machine blind hem. 1. 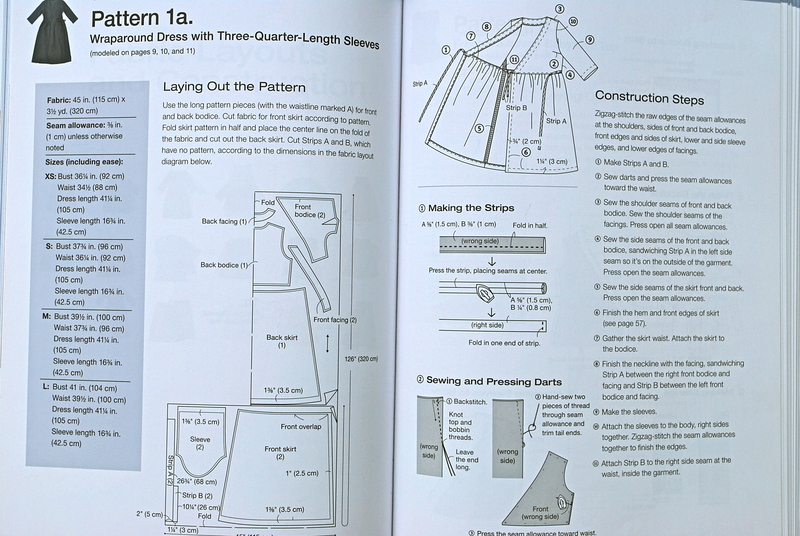 The pattern size range is from 6 to 16. 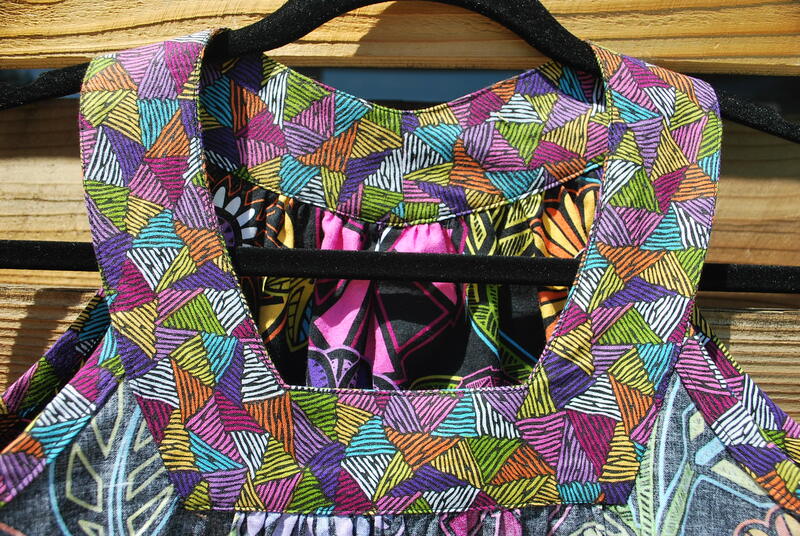 Obiviously this is a very loose fitting design and the bust is the main measurement needed to gage your size. I cut a 12 with no alterations. 2. 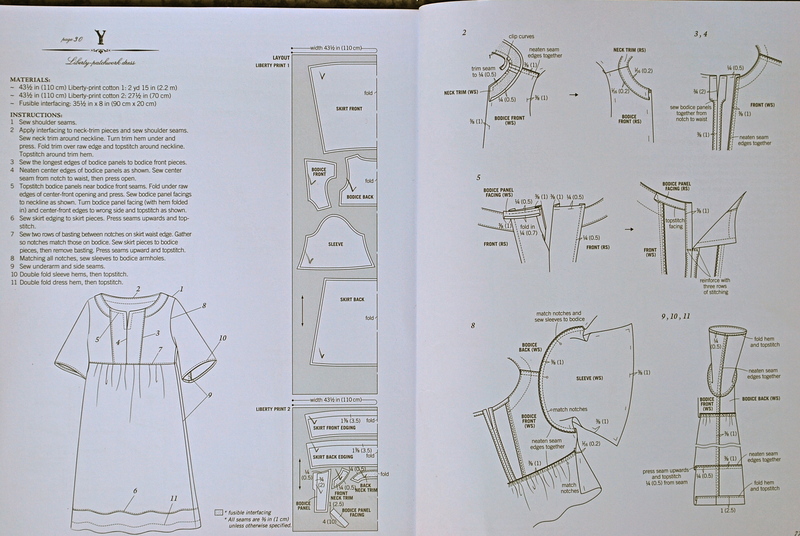 The width throughout the bodice and where it meets the skirt is wider than it appears in the photograph on the very skinny model in the book. 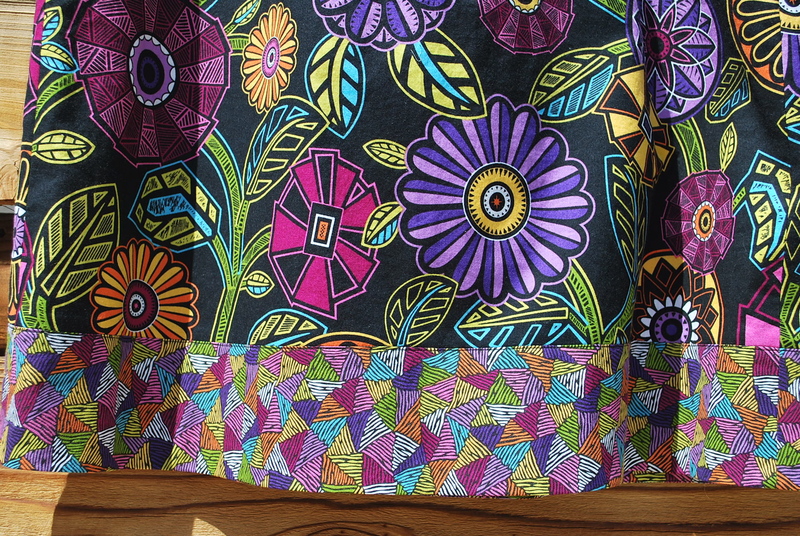 It almost A-lines from the armhole. 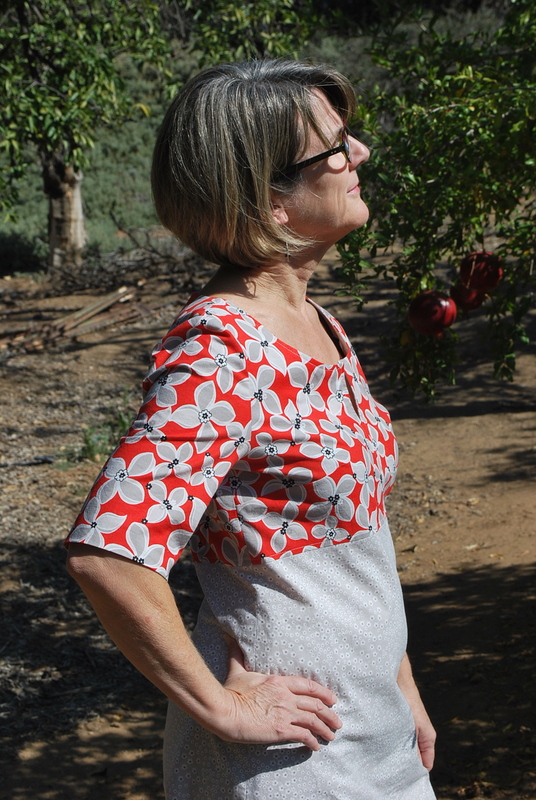 I am considering this a surprise design feature (I didn’t study the pattern pieces), rather than a misfit, because the shoulders and neckline are perfect. I feel it might not be the most flattering thing, especially from a side view, for me to have all that width floating around me. 3. 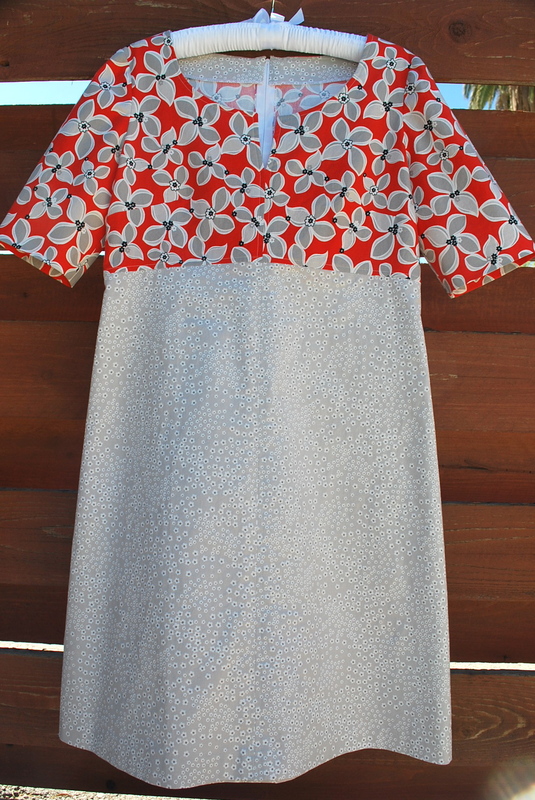 Ok, after making three Japanese patterns, there is no denying they are well drafted. And also fit well, at least for a relatively narrow size range. BUT, the instructions are inadequate. (Enlarge the photo of the book above.) Beginner beware! Stay away. 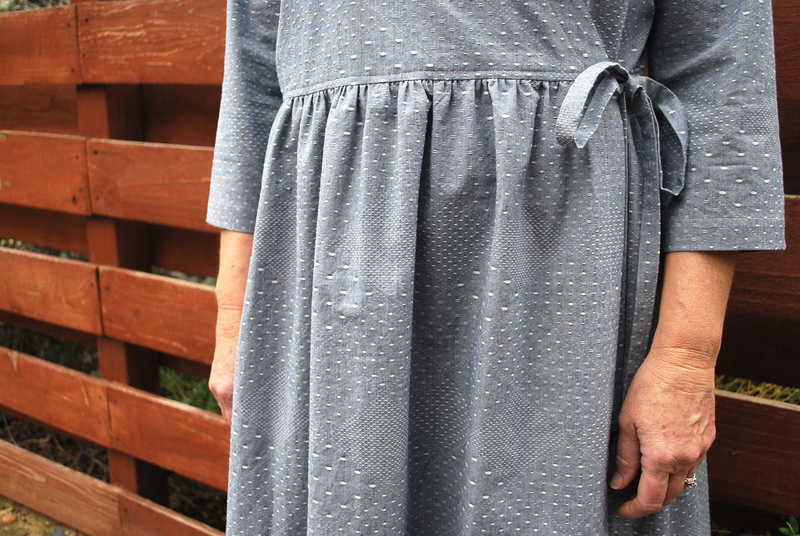 I because of my sewing experience, I can make a basic dress without instructions, but I try to look at what is presented from a beginner standpoint. 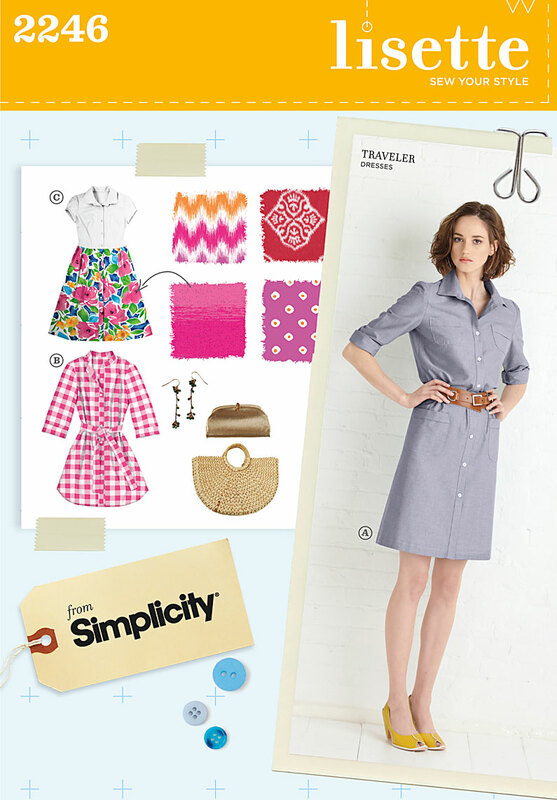 I definitely would not attempt one of these patterns without a body of sewing knowledge. 4. I would like to question one method in the instructions. 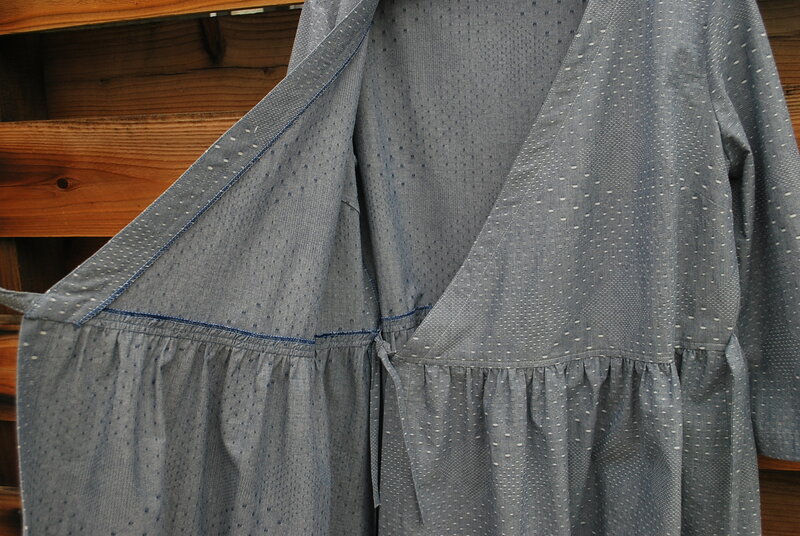 They show laying the garment out flat and sewing the sleeve in before the side seams. I usually save this technique for knits and/or sleeve caps with a straighter curve. 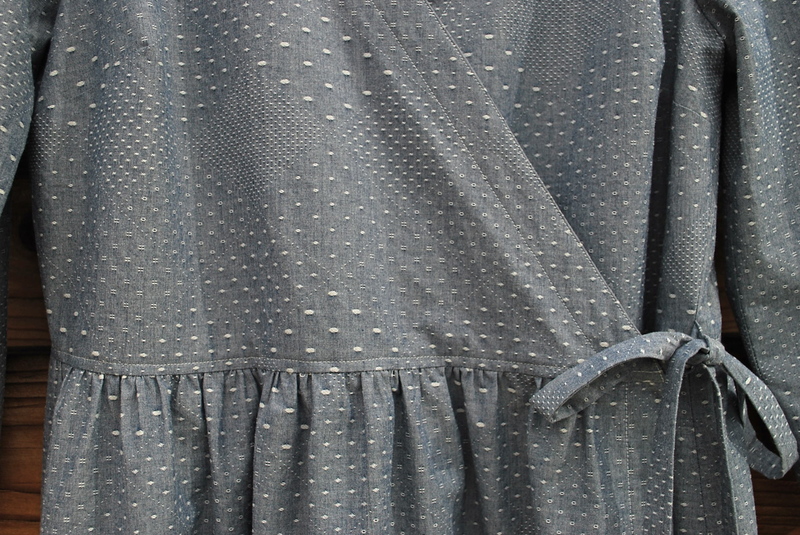 The sleeve cap in Dress Y has a fairly high curve and I think would ease in better insetting it after the side seams are sewn. At least that’s what I did, and it work well. 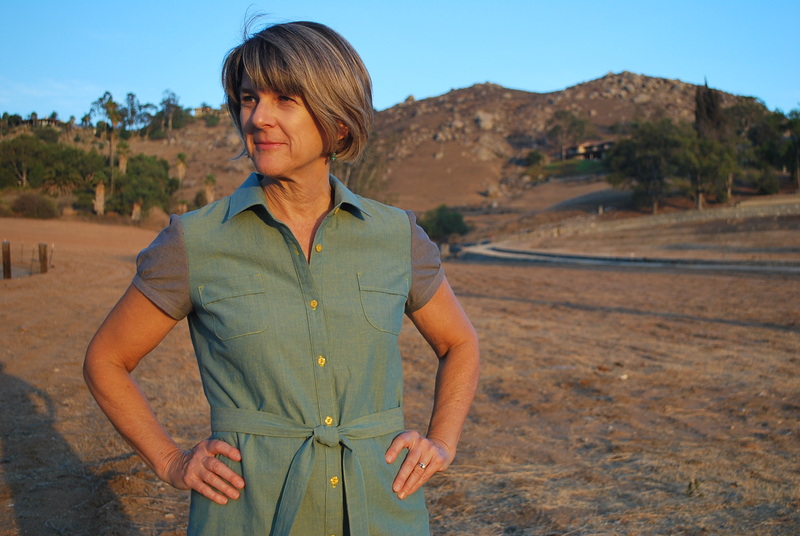 Overall, despite the slightly tent-like sillouette, I love this dress. 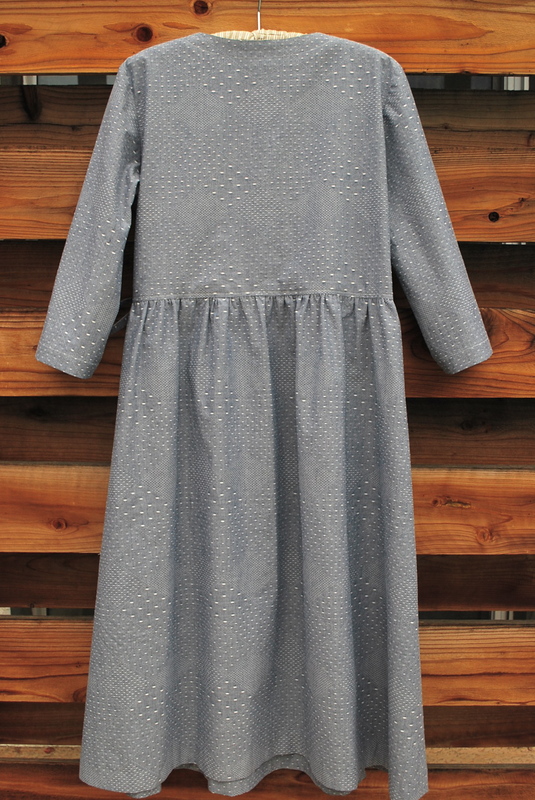 The fabric is soft, smooth and lighter than air. Dress Y like a pair of shoes that are super comfortable the first time you try them on – I know I’ll reach for it over and over again. 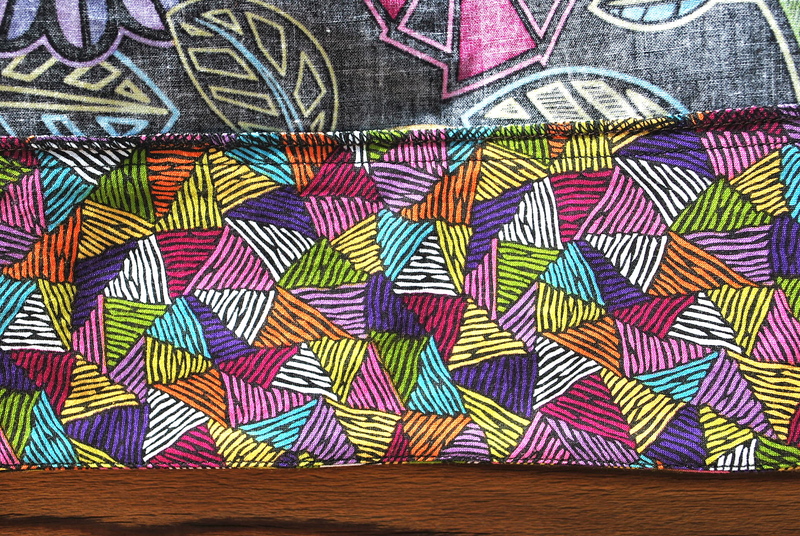 Have you tried any Japanese patterns? Which ones? Are you a skeptic or fan? 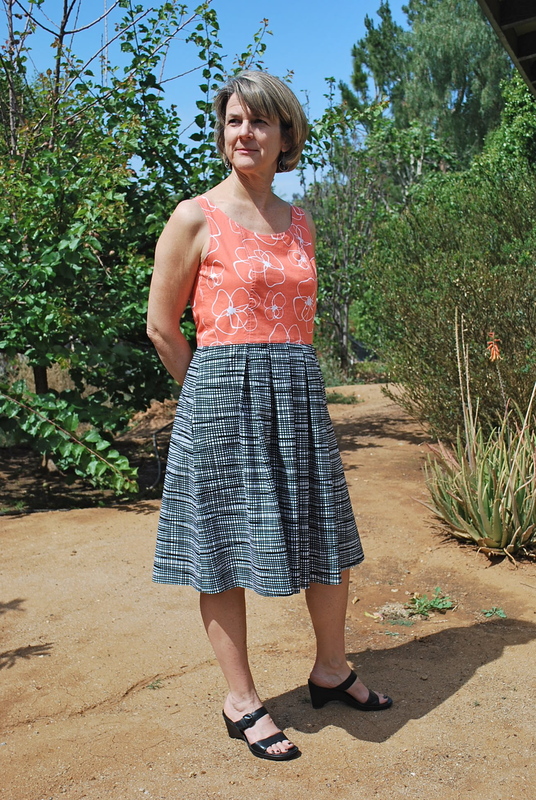 As soon as I saw this pattern while shopping a Butterick pattern sale at JoAnn’s several months ago, I knew I wanted to make this for my sister-in-law who loves that 50’s retro vibe. 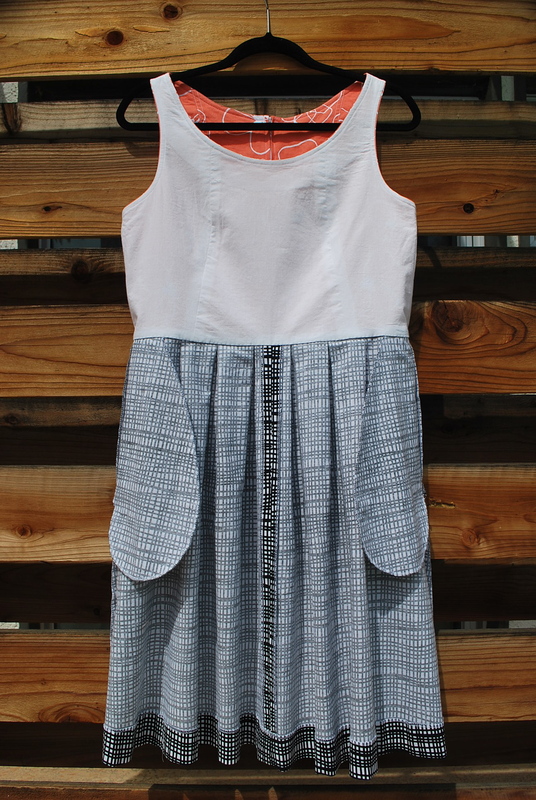 So I am once again sewing someone else stylish for Fresh Make #18. 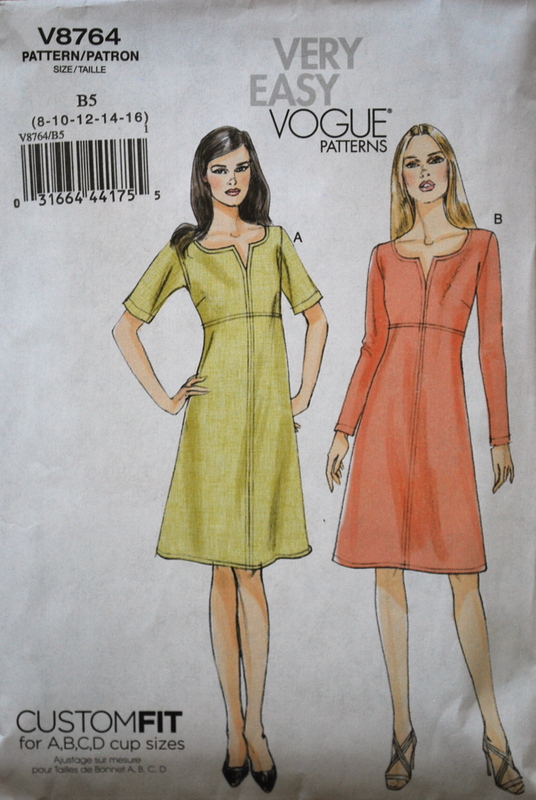 The pattern I used is Butterick 5982. 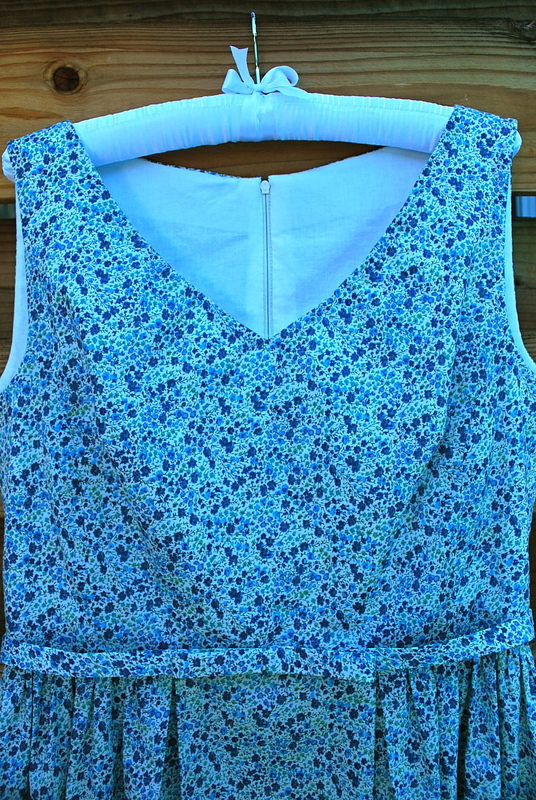 I basically made a sleeveless version of view C. As mentioned above, I bought the pattern on sale at JoAnn’s for $1.40. 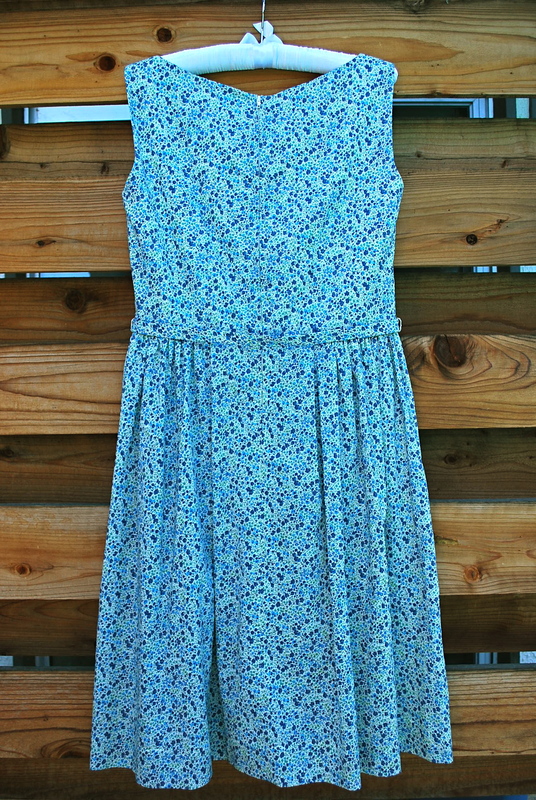 I named it the Jennifer Dress after my sister-in-law. 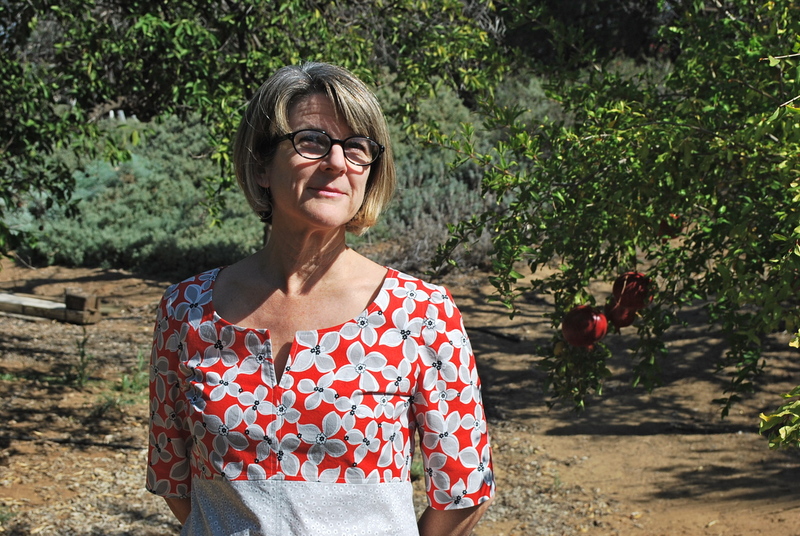 The fabric is a soft, smooth lawn cotton we purchased at The Fabric Store on La Brea Avenue in Los Angeles. 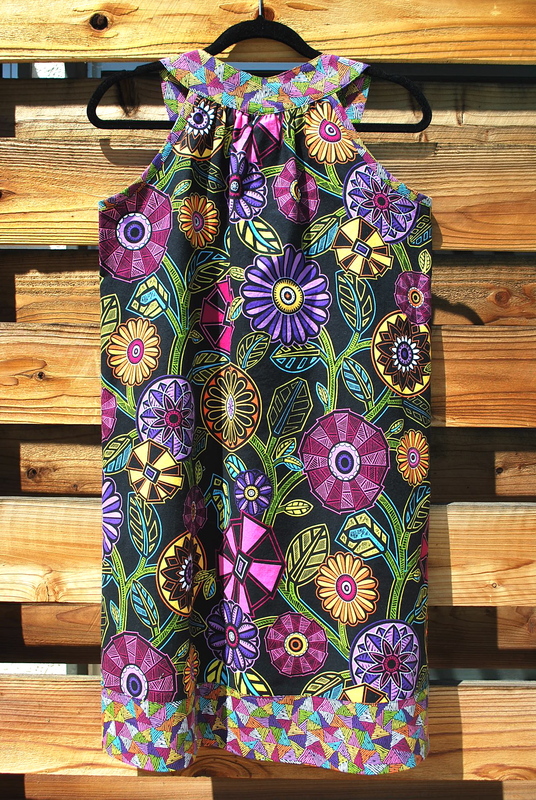 My photos unfortunately do not do this fabric justice. 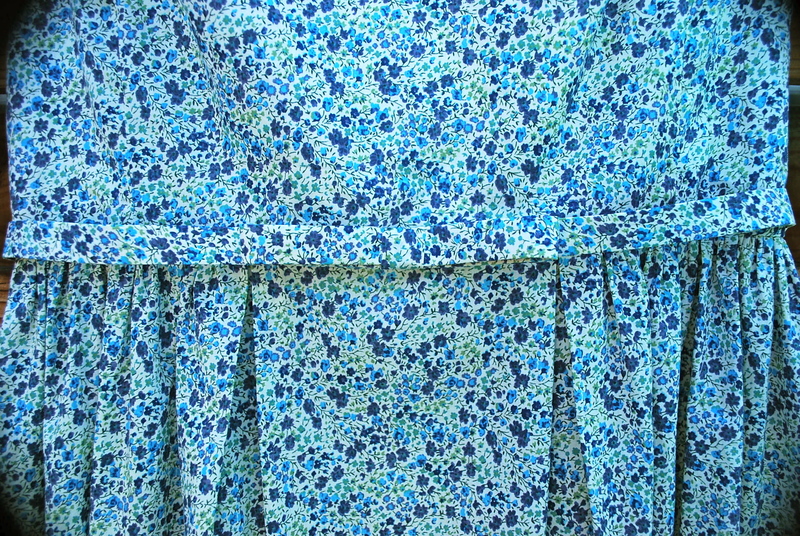 It’s a calico like print of rich blue colored flowers set on a creamy white background, and it’s looks beautiful against Jennifer’s sun kissed skin. Please excuse the coloring in this photos. I took it in the early morning and then went to Jennifer’s house and gave the dress to her. So no retakes. 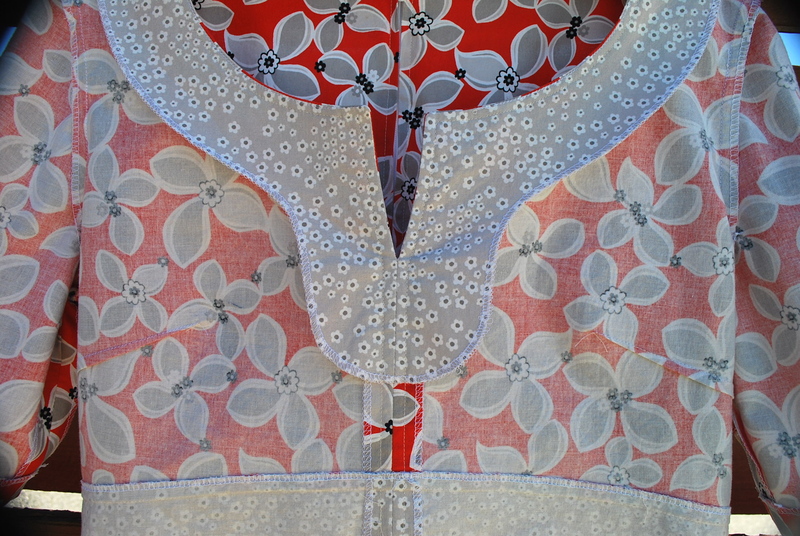 The bodice is fully lined in a white cotton. 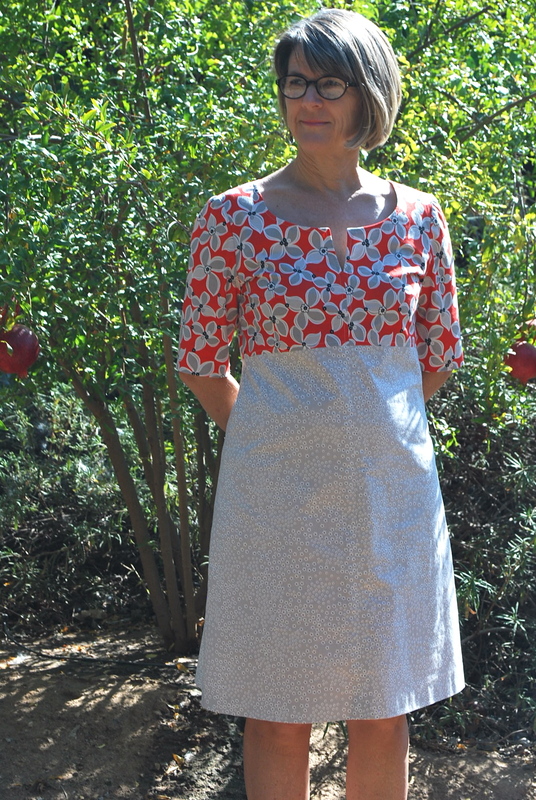 I did some “slow sewing” as I attached the lining by hand along the zipper and waist. 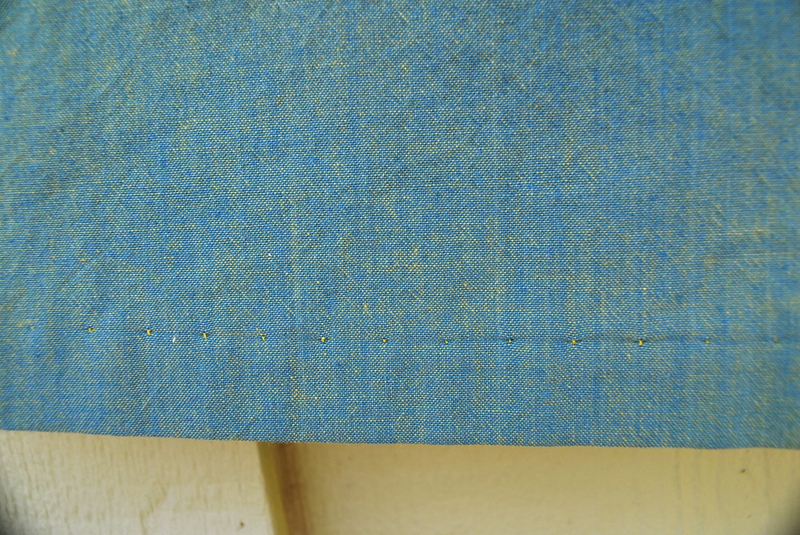 I also did a hand hem after machine sewing hem tape on the bottom edge. 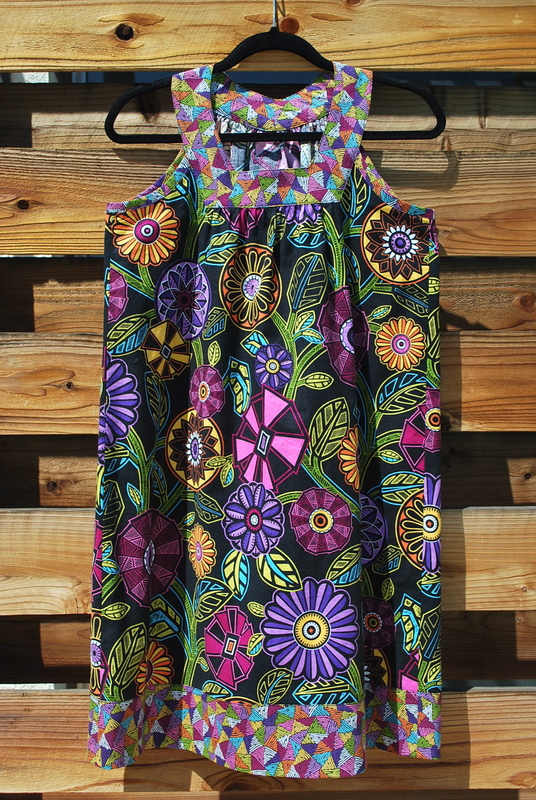 You might notice some puckering at the neckline. You can read about that below if you’re interested. Jennifer is on the front porch of her newly purchased home! 1. 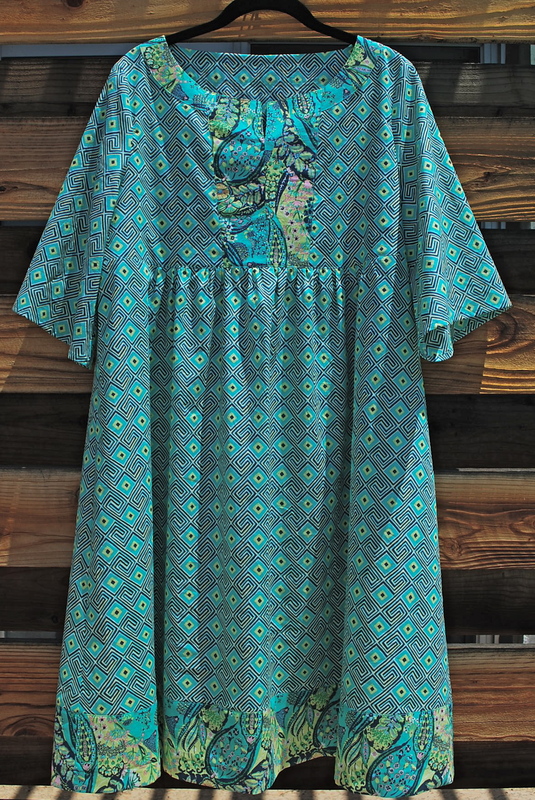 It is always a joy for me to sew for others. The drawback is coordinating fittings or sacrificing a few when that person does not live that close to me. 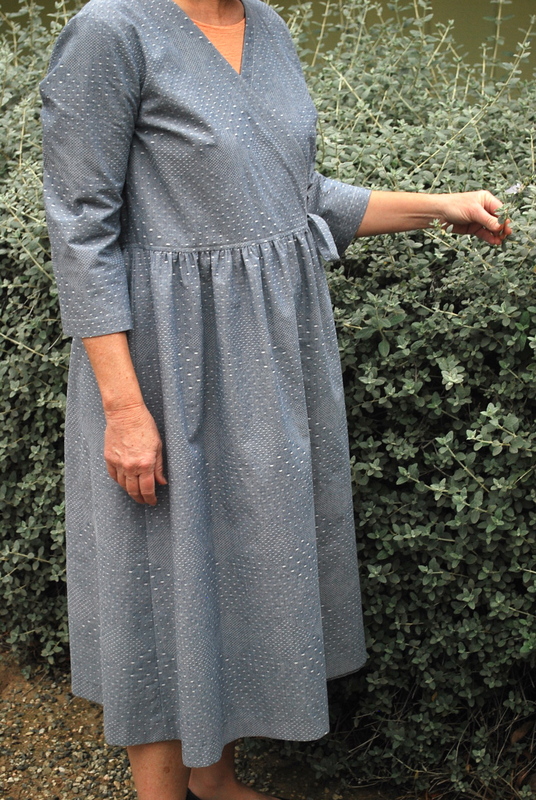 On the first fitting, before I applied the lining or did any finish work, the neckline layed flat on Jennifer. 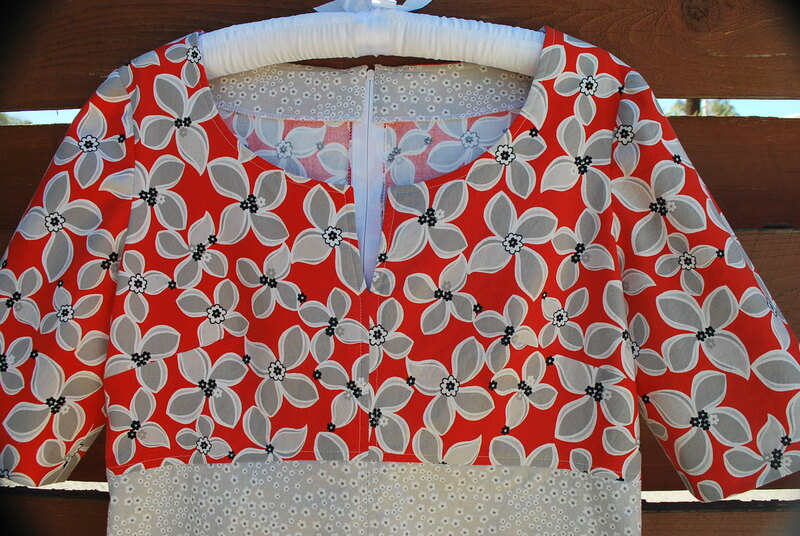 On the second fitting, it pooched out as if the fabric was stretched when I attached the lining at the neckline. I was flummoxed and the truth is it didn’t matter how it happened, I needed to find way to fix it. I was not up for ripping out the lining and re-doing the whole bodice. I had not yet attached the lining at the waist, I decided to run some rows of basing stitches on the lining layer only, close to the neck edge and ease in the extra width. 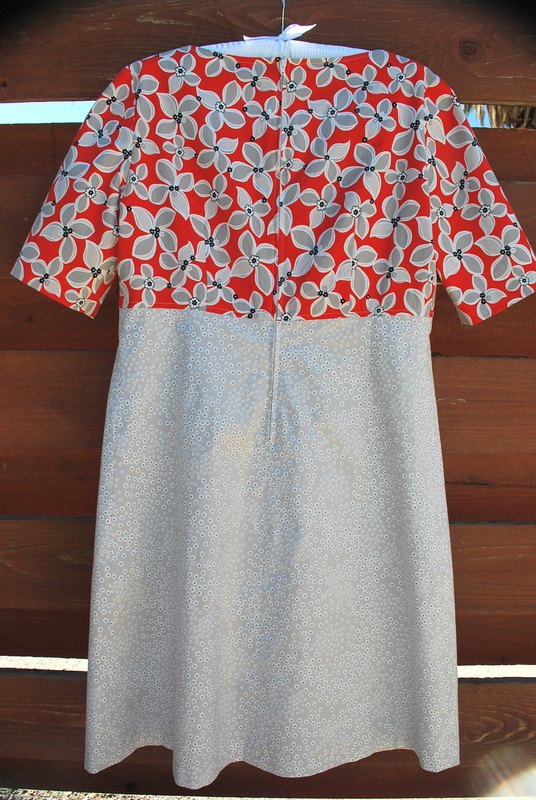 You can see this in the photo of the dress inside. It’s not a proud sewing moment for me, but a reasonable solution. Jennifer was fine with it. 2. 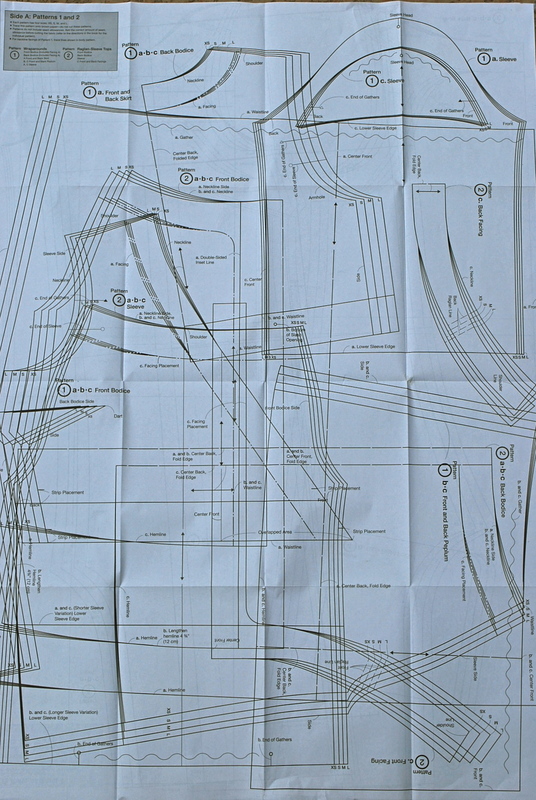 It’s a bit confusing as to how the bodice is supposed to fit on this pattern. 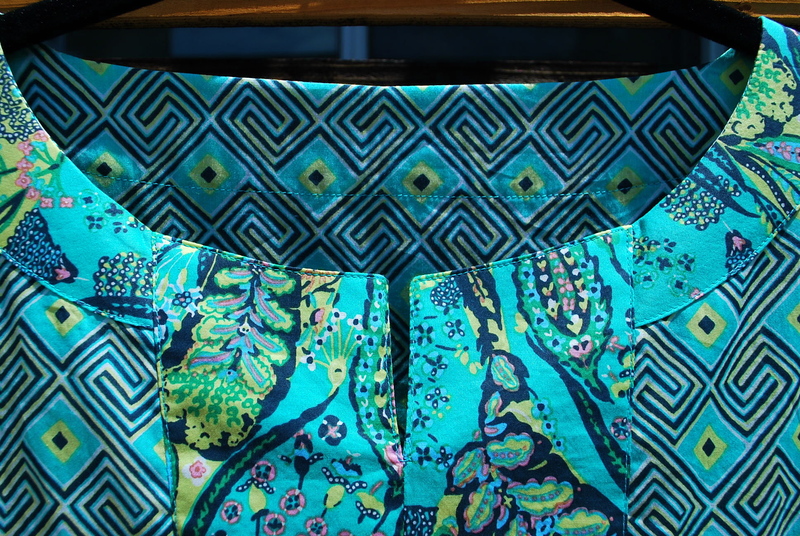 Of course, the beauty of sewing is you can make it fit however you want. 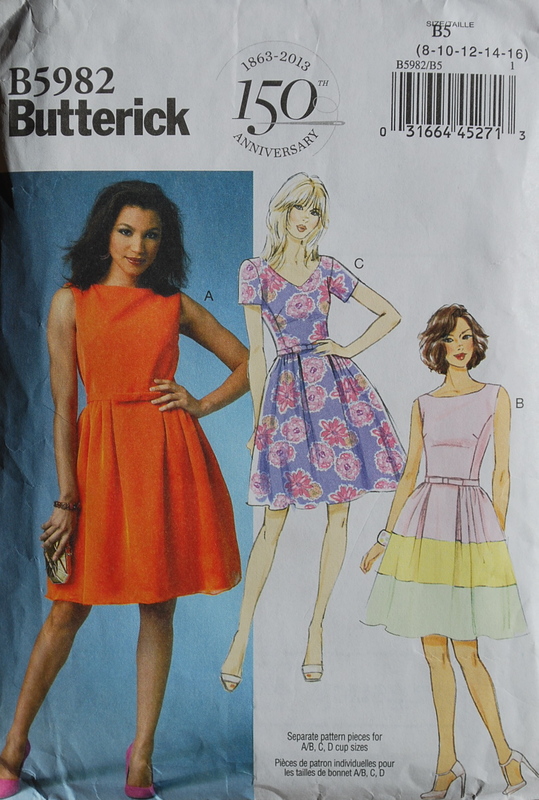 I just want to point out that the photo of the orange dress on the envelope front has a semi-fitted bodice, and the illustrations look close-fitted. Additionally the description on the back of the pattern says “close-fitting.” Jennifer’s bodice fits like the photo, which is a good thing because she doesn’t care for form-fitting clothes. 3. The pattern is labeled EASY. 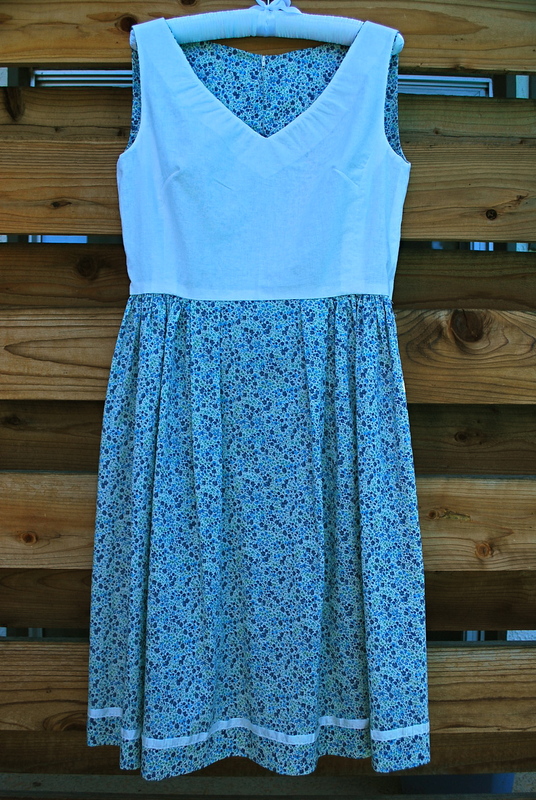 It might be easy for this style of dress, but would say it does required some intermediate sewing skills. 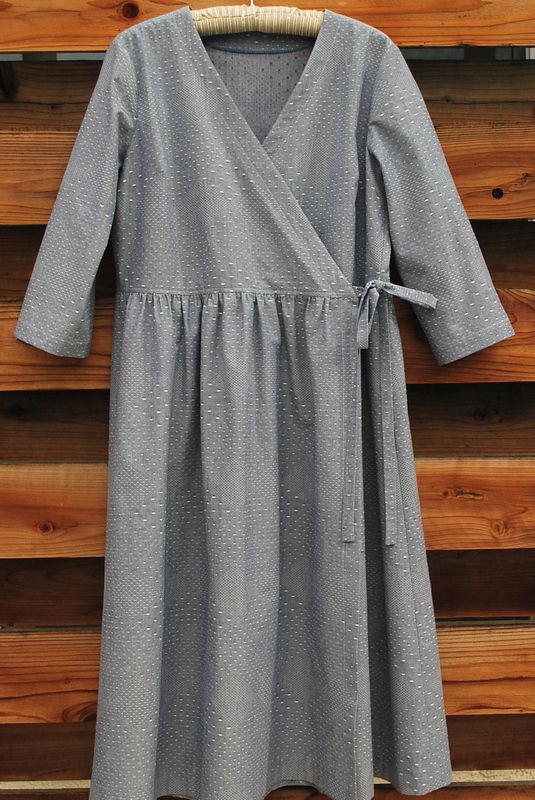 At least some experience with gathers, zippers, facings and linings. 4. 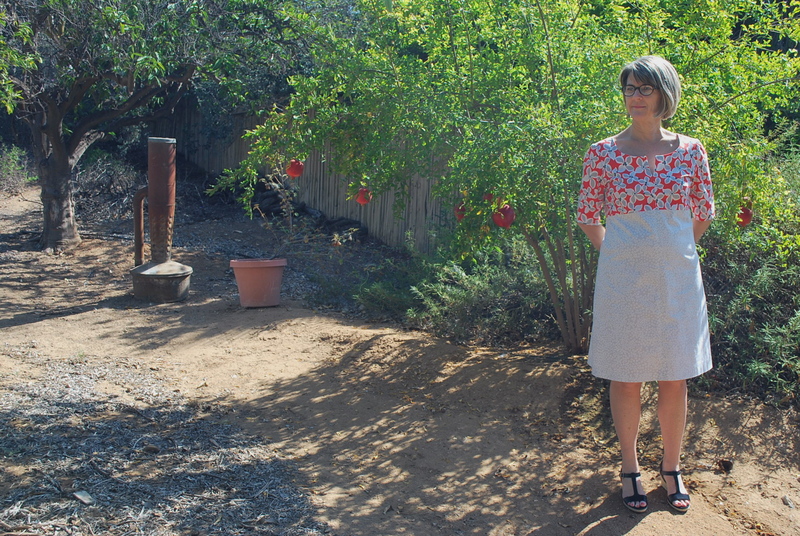 Jennifer wanted the dress to hit below her knees, so I added 5″ to the skirt bottom when cutting out the fabric. It was just enough for a 2″ hem. 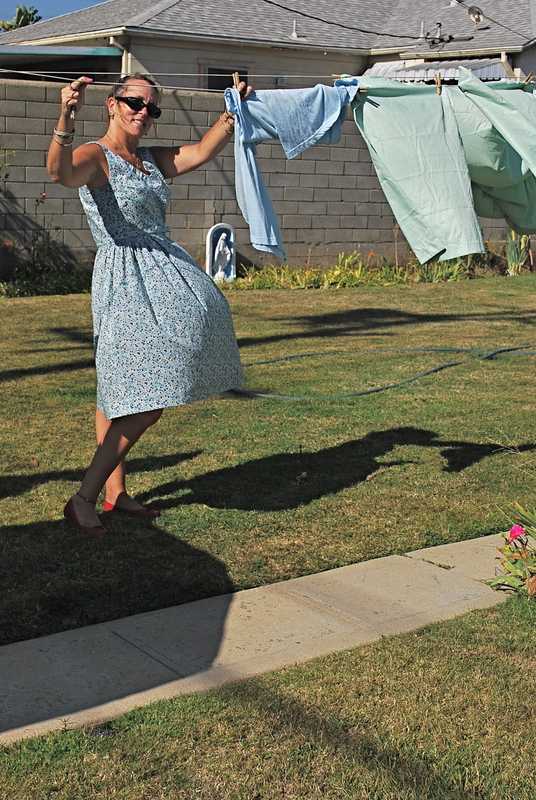 I think Jennifer loves her new dress. 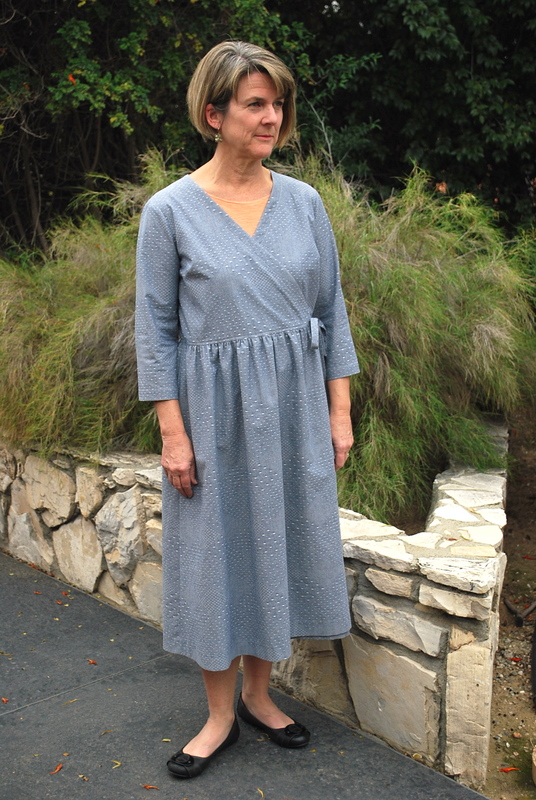 When she put the finished dress on for our photo shoot, she didn’t want to take it off. But she did because she wanted to keep it nice to wear on the first day of school. She’s a third grade teacher.